There’s something exciting about hitting the open road. The anticipation of waiting to explore what lies beyond the horizon creates a rush that flying in an airplane can’t recreate. America is full of fantastic road trips thanks to the infrastructure of accessible roads and highways that span every state, but few rivals a Utah winter road trip through the five stunning national parks that dominate the southern part of the state. Arches, Canyonlands, Capitol Reef, Bryce Canyon, and Zion all have unique landscapes and natural rock formations that leave even the most seasoned traveler in awe. 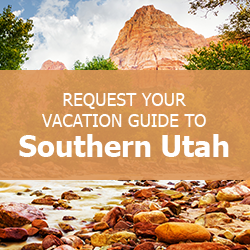 For more attractions, activities, and places to stop along your route, request access to our free Southern Utah Vacation Guide! Plan Your Road Trip Today! Start your road trip in the Arches National Park. A collection of mind-boggling red rock arches dominate the land, providing visitors with some of the most iconic landscape imagery in the country. Trails, campsites, and the visitor center are all open throughout the winter, but there are no ranger-led hikes during the season. While some trails can become hazardous due to ice buildup, the cold temperatures, lack of crowds, and quiet tranquility make this a great time to visit the park. The next stop on your Utah winter road trip is magnificent Canyonlands National Park, which is only 30 minutes south of Arches National Park. This park contains four distinct regions separated by rivers: The Needles, Island in the Sky, The Maze, and the rivers. The Needles and Island in the Sky visitors centers close during the winter, making these two parts of the park more difficult to access on your trip. The Maze region of the park is open longer but is still tricky to navigate through in the snow. However, if you take your time and prepare yourself, you can explore all of these sections during the winter time. The winding canyons, tall needle-like structures, and scenic viewpoints make this one of the most diverse national parks in Utah. Tip: Make sure you check the park website before traveling here, as the roads may be impassible after a bad storm. Bring your own water and food when visiting the park. Head two hours west to Capitol Reef National Park, which is much easier to access than Canyonlands and is the perfect next stop on your road trip through Utah. This park turns into a private playground in the winter, displaying the forces of nature through its wind and water washed sandstone valleys and peaks. Hiking is the main activity in the winter, but if you stick around through the evening, the night sky is full of beautiful stargazing opportunities. Your next stop is Bryce Canyon National Park, which is two and a half hours southwest of Capitol Reef. With amazing hiking, snowshoeing, and stargazing, this is one of the best stops along your route. Certain parts of the park are not accessible in the winter, but the Amphitheater, lined with the worlds largest collection of hoodoos (a tall, thin spire of rock), makes for an unparalleled winter visit. Your last stop, Zion National Park, is only an hour and a half southwest of Bryce Canyon. The low elevation compared to other national parks in the state makes for pleasant temperatures and less snow. While the hiking is top-notch, the main attraction here are the photogenic landscapes. Whether you catch a sunrise, sunset, or starry skies, bring your camera and get ready for a fantastic viewing experience. End Your Road Trip at a Family Time Vacation Rentals Property! After you finish up at Zion National Park, head 50 minutes north to a Family Time Vacation rentals home. Our amazing properties make for the perfect place to relax after your long and exciting winter road trip. If you need another taste of adventure, rent a snowmobile or go skiing at Brian Head Resort. Don’t forget to request access to our free Southern Utah Vacation Guide to start planning your trip to our winter wonderland today!